Paul D. Spudis is a senior staff scientist at the Lunar and Planetary Institute in Houston, Texas. His research focuses on the processes of impact and volcanism on the planets and studies of the requirements for sustainable human presence on the Moon. He has contributed to multiple robotic moon missions, and was a member of the President’s Commission on the Implementation of U. S. Space Exploration Policy in 2004. He has written seven books about the moon. 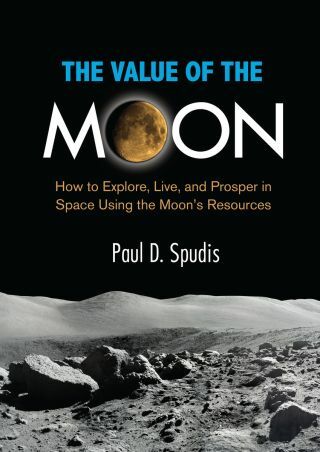 His latest book is called "The Value of the Moon: How to Explore, Live and Prosper in Space Using the Moon's Resources," (Smithsonian Books, 2016). Be sure to check out our Q&A with Spudis about the new book. Nearly all of our modern space assets reside in the zone between Earth and Moon (cislunar space) and the difficulty of reaching low Earth orbit (LEO) limits our activities there. These cislunar satellites constitute the backbone of modern technical civilization and conduct critical societal functions such as communications, positioning, remote sensing, weather monitoring, and national strategic surveillance. The size and capability of such assets are limited by the size of the largest rocket that can launch a given payload and by their preordained operational lifetime. Our experience working with the space shuttle and [International Space Station] programs has demonstrated that people and machines working together, over time, can assemble and maintain space systems that can be made as large and operated for as long as desired. The problem is moving people and robots to these various points in cislunar space. To become a space faring species, we must develop and possess freedom of movement and action, throughout cislunar space. Robotic missions show that the Moon’s poles contain significant amounts of water ice, the most useable resource for humans in space. As a consumable, H2O (water and oxygen) supports life. Used as shielding, water can protect people from cosmic radiation. Water is also a medium of energy storage; it can be dissociated into its component hydrogen and oxygen using electricity generated by sunlight and during local night or eclipse, these gases can be combined back into water to generate electricity. Finally, liquid hydrogen and oxygen are the most powerful chemical rocket propellant known, which opens the possibility for the Moon to become our first "offshore" coaling station in the sea of cislunar space. Because the Moon is close, the time delay for a round-trip radio signal is less than three seconds. This gift of proximity makes it possible for machines, under the control of operators on Earth, to begin the initial work of establishing a demonstration resource processing facility on the Moon. Transit times to the Moon are as short as three days, and launch opportunities are always available. Some peaks and crater rims near the ice-rich lunar poles experience nearly constant sunlight, permitting the near-constant generation of electrical power with solar arrays. The individual pieces of equipment necessary to begin the harvesting of lunar ice are small and can be launched on small and medium-lift rockets. We can begin to install and operate a lunar polar resource extraction facility now, without waiting for the advent of new, heavy lift launch systems. A scaled, incremental approach to building a facility on the Moon can fit under nearly any budgetary envelope and offers numerous, intermediate milestones to document accomplishment and to map steady progress. Finally, the use of multiple, small steps to develop the Moon facilitates the participation of both international and commercial partners in creating a permanent space transportation system. Making the Moon and cislunar space our next strategic goal in space solves many problems. It creates a near-term (decadal, not multi-decadal) objective against which progress can be demonstrated and measured, inviting myriad ideas and participation. It can be built in incremental steps, tailored to be affordable under a wide variety of restrictive budget regimes. It creates a lasting infrastructure that allows people and machines access to all of the locations in cislunar space—the location of scientific, economic, and strategic assets. We will finally have laid the groundwork necessary to navigate past self-imposed roadblocks, thereby opening the solar system to exploration through the creation of a space transportation network that allows routine departure from, and return to, low Earth orbit. Because we are dependent on space assets—the technology that controls, assists, and enhances so much of our daily lives—the current aimless direction of our civil space program not only endangers the agency’s future but also jeopardizes critical national interests. Creating routine access to cislunar space will allow us to graduate from the "flags and footprints" model of human space travel to the creation, use, and control of a true, long-term space faring capability. We can do this in a manner that is scalable and thus affordable. It is the right direction for our civil space program in the new millennium. Developing cislunar space and the Moon is a challenging but achievable goal. Although we are uncertain where this journey ultimately will take us, history records that humanity always gains knowledge and prospers when we expand our horizons. Using the Moon’s resources to explore space and to live and prosper there will increase our chances for long-term survival and improve our quality of life. This great challenge holds the promise of breakthrough technologies and new discoveries that will ensure better futures for us all.